For the past five years, this area off Snæfellsnes Peninsula has been chosen by the herring as their port of call, attracting many orca. This phenomenon provides a golden opportunity to see (and hear) the vast number of orca swimming in the fjord. It is possible to get close on the boat trip to watch the whales and hear them as they surface. This trip is a perfect opportunity to take unique photographs of these massive mammals enjoying a feast of herring, day after day. As we look for orca, quite often we will come across a pod of dolphins or catch a glimpse of white-tailed eagles hovering overhead. Diving gannets, en masse, is also a common sight. In contrast to December, January and February when there can be as little as four hours of daylight, in late March we will have more daylight and therefore more opportunity to see the wildlife and breathtaking landscape (land tours to the glacier). 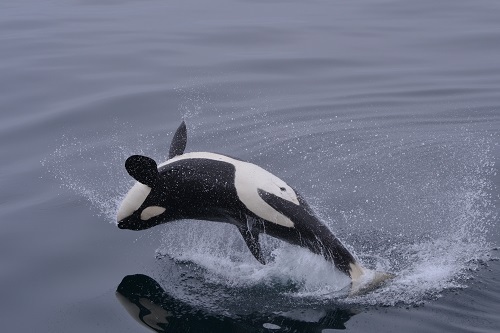 Based on sighting statistics from previous years means we have an excellent chance to see orca in abundance. In the unlikely event that the orca are not in the Fjord, our boat company will offer trips from another part of the peninsula where sightings of Minke whales, fin whales, humpback whales and several dolphin species are common.